Teaching with "A Thinking Person's Guide to America's National Parks"
The editors of A Thinking Person's Guide to America's National Parks have created a complete set of free teaching materials for a course titled "Introduction to America's National Park System: Managing the Natural and Cultural Heritage of a Changing Nation." 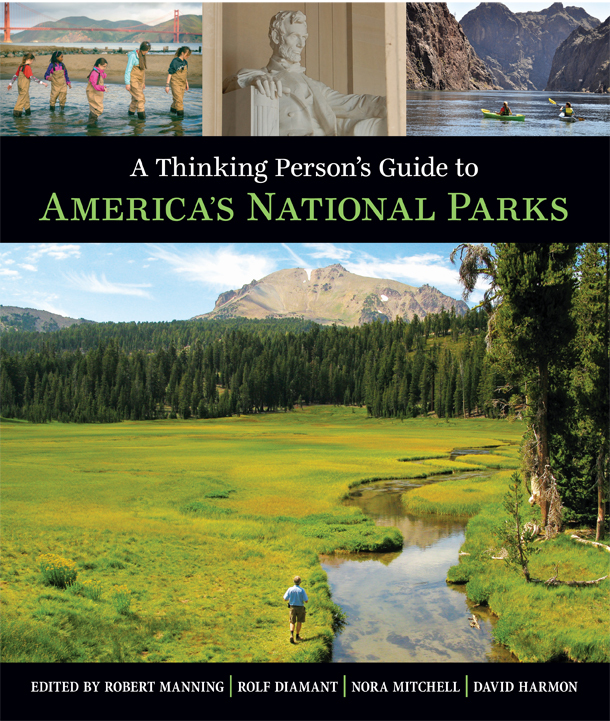 This 24-lesson course uses the book as the core text, and each lesson includes research questions that students explore via the National Park Service's website. The course covers the full variety of resources in America's national parks—and the challenges of managing them. A syllabus for the 24-lesson course, including course objectives, class structure, research questions, and lesson-by-lesson readings from A Thinking Person’s Guide. An extensive Sources list is included, full of ideas for supplemental readings and other sources of information. The syllabus is written for an undergraduate course, but can be easily customized for other levels of learners. A set of 24 PowerPoint presentations, one for each chapter in the book, with embedded captions. Most presentations contain 8–10 slides illustrated with photos from the book and explanatory captions. Almost every one of the over 350 photos in the book is included in the set. A single Word document with all the embedded captions, ready to be customized. You are welcome to download these materials, but only for educational and other noncommercial purposes. Below you'll find downloads of Word versions (.docx) of the syllabus, native PowerPoint (.pptx) versions of the PowerPoint presentations, and Word versions (.docx) of the captions file and exam questions. These versions are fully editable so you can customize them to meet your needs. We also offer PDF versions of the syllabus and PowerPoint presentations; they are not customizable but may be convenient in certain situations. The PDF files of the PowerPoint presentations are much smaller than the native PowerPoint files. If you are using the book in your course, would you please let the editors know? We'd like to keep track of how the book is being used. Kindly send a note to Dave Harmon at dharmon@georgewright.org. © 2018 Robert Manning, Rolf Diamant, Nora Mitchell, David Harmon, and George Braziller Publishers, Inc. All rights reserved. All materials linked below come under this copyright. You have permission to download these materials, but only for educational and other noncommercial purposes. You also have permission to alter them, but only for classroom use. Any altered versions you create may not be republished or recirculated in any way. By downloading one or more of these files, you agree to abide by these copyright restrictions.